Why are so many people fascinated by airplanes? 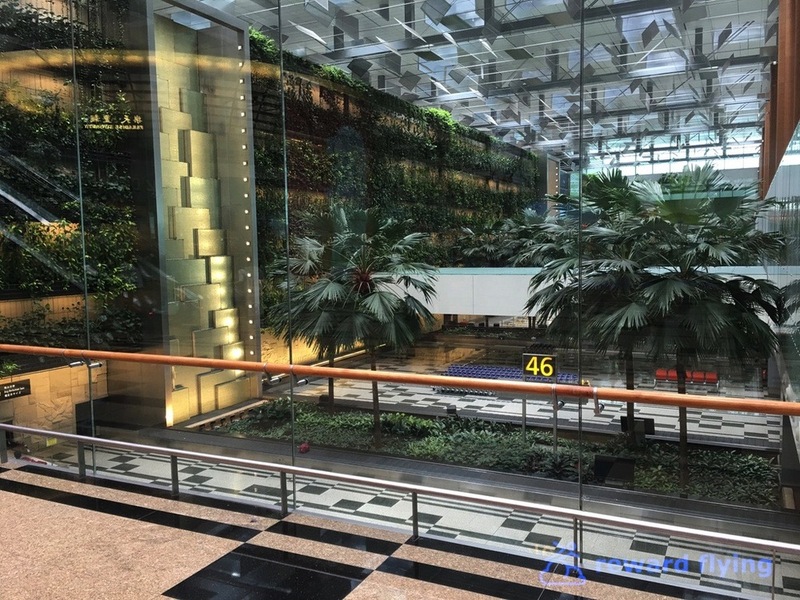 I know I am, and judging by the crowd of people taking photos of Singapore Airlines' new A350 at Changi airport this afternoon, there are plenty others. Many might think it odd to fly half way around the world just to fly in a plane for 35 minutes, but the enthusiasts are jealous. Even the people who fly for a paycheck can be infected with this strange excitement. Carol an experienced flight attendant on my 186 mile journey told me she too was extremely excited to be flying on this plane for the first time. Yet Lee, another attendant was not, simply telling me it was just another flight for her. 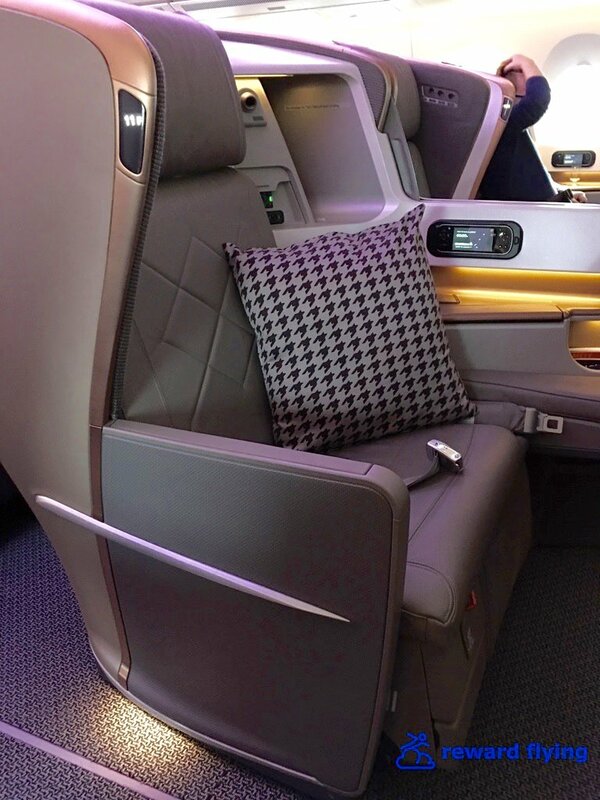 Singapore Airlines is well known for their premium class service. Obviously I would not be getting the full treatment on this short flight. 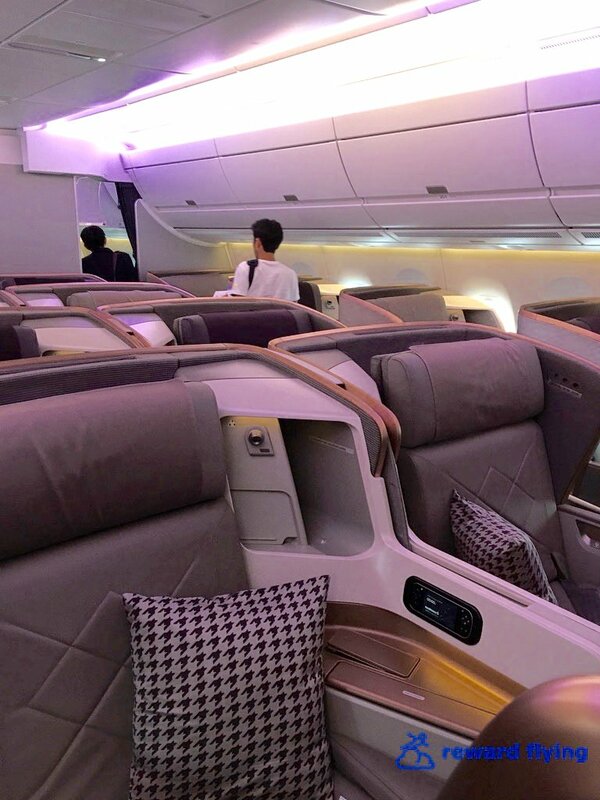 My reward was to see the stunning cabin, hear the powerful Rolls Royce Trent XWB-84 engines roar on takeoff, sit in SQ's highly regarded business class seat and skim the top of the clouds at 20,000 feet for a few minutes in a brand new state of the art airplane. My first impression, the new Airbus A350 is incredibly quiet when airborne. I've looked at the cabin photos I took and simply don't think they portrait how beautiful this aircraft is. I was just blown away. The cabin doesn't look like an airplane cabin. The seats don't look like an airplane seat. They look like something you might sit in at a luxurious resort while having a drink in their private club, at least that's my imagination of where you might find something like this. But it was an airplane seat and sadly, in my judgement, does have a number of flaws. 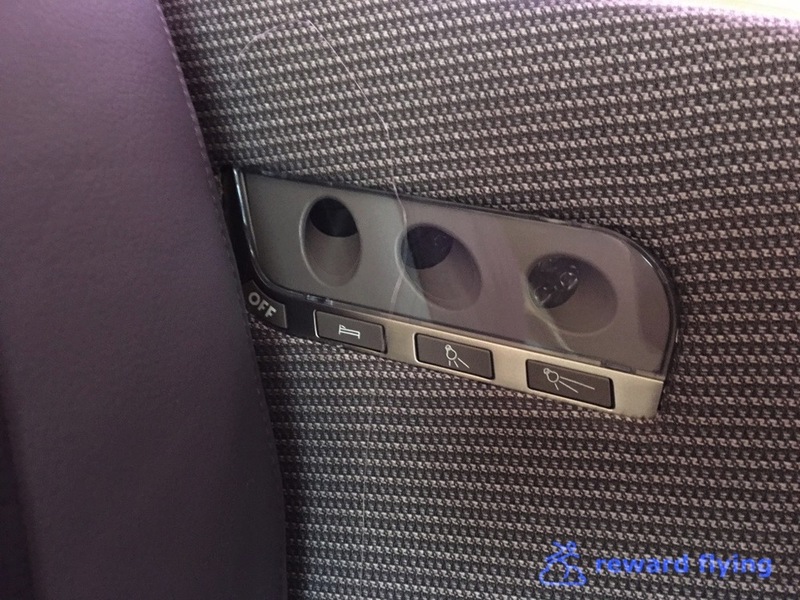 The armrest is the latch for your tray table. In my few minutes on the plane I must have unhinged it 10 times. 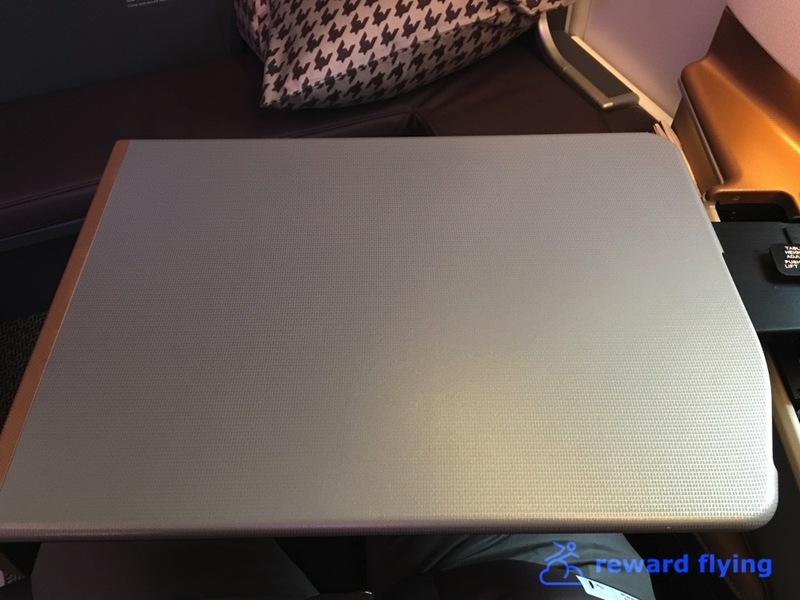 But the tray is large and has a unique feature that allows a height adjustment. There is no place to put your drink. 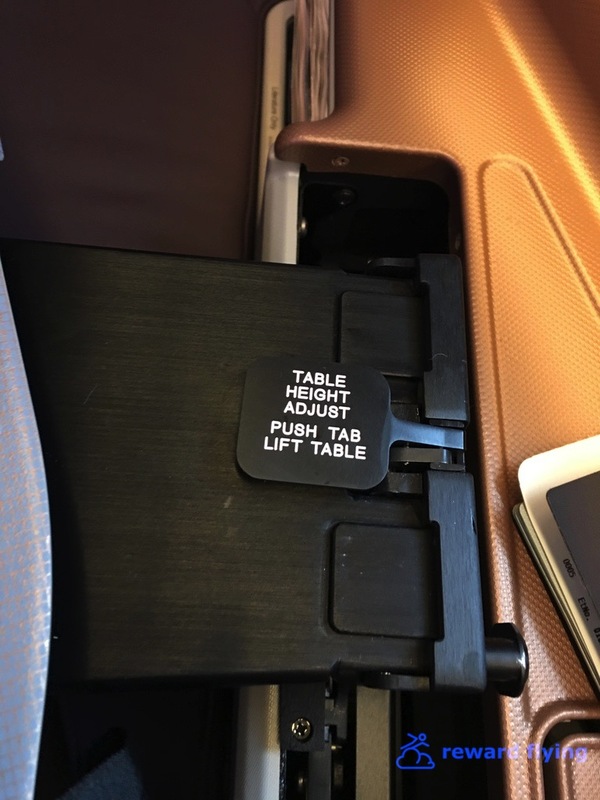 The only place is on top a storage compartment door next to the tray table but no cutout to hold the glass and it's to your side and slightly behind so you have to reach across your body to hold the glass in the event of turbulence. Maybe you put your glass inside the compartment??? When sitting straight forward in the seat you can not stretch your legs out completely. There is a cutout for your feet off to the side and when the bed is extended this is where you put your feet. The bed must be manually set as the seat electronics allow for maybe a 30 degree recline. The plus side is that the large monitor is closer allowing for excellent viewing while sitting. While the seats are in a container like a suite, they are not super private because they aren't offset. Looking to your side you can clearly see the other 3 passengers in your row. While not a huge issue (once you recline or go flat it's a non issue), many airlines have gone the staggered route to offer that extra level of privacy. Also, each window seat has one window, that said they are large on the A350, similar to the Boeing 787. The aisles are extremely narrow. These nice new seats are going to be full of scuff marks from luggage wheels banging against them. Only one person can be in the aisle at a time. You simply can not squeeze past someone in the aisle. I tried, you can't do it. I'm sure the flight attendants have already voiced their displeasure over the narrowness of the aisle. Storage of carry on luggage might be an issue. To give the cabin a more open feeling the center seats don't have overhead bins. 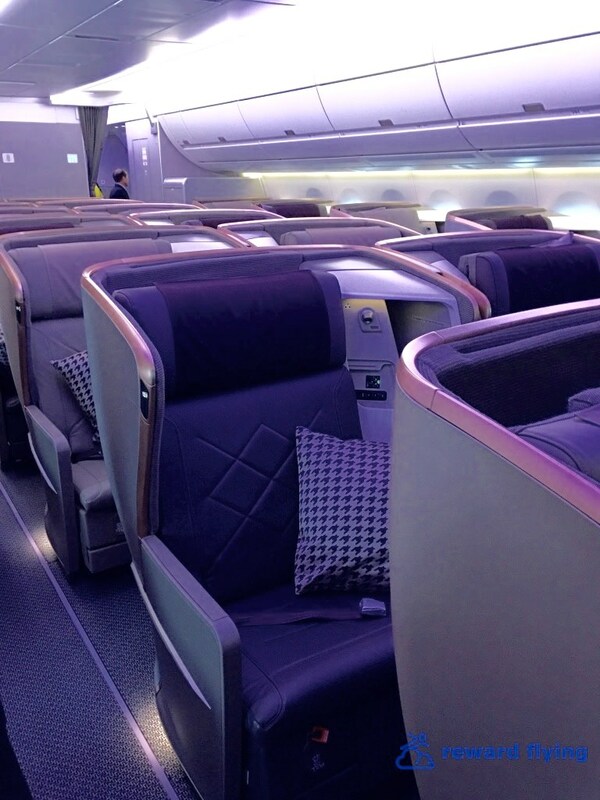 While the bins above the window seats are large, space inside them might be at a premium with full cabins. Also the crew rest area is above the center seats in the front row so that ceiling is lower. The best seats all have pros and cons. Bulkhead row 11 in front is where the aisle narrows and you are closer to your center neighbors than any other seat. The back row in the front cabin puts you closest to the galley while the seats in between you're at the mercy of someone trying to let someone else through. The front row in the back cabin is where the bassinets are located so you can either get reseated or sit next to a less than professional neighbor who makes lots of noise. The back row is in front of economy. How about just get a seat on this fabulous plane! 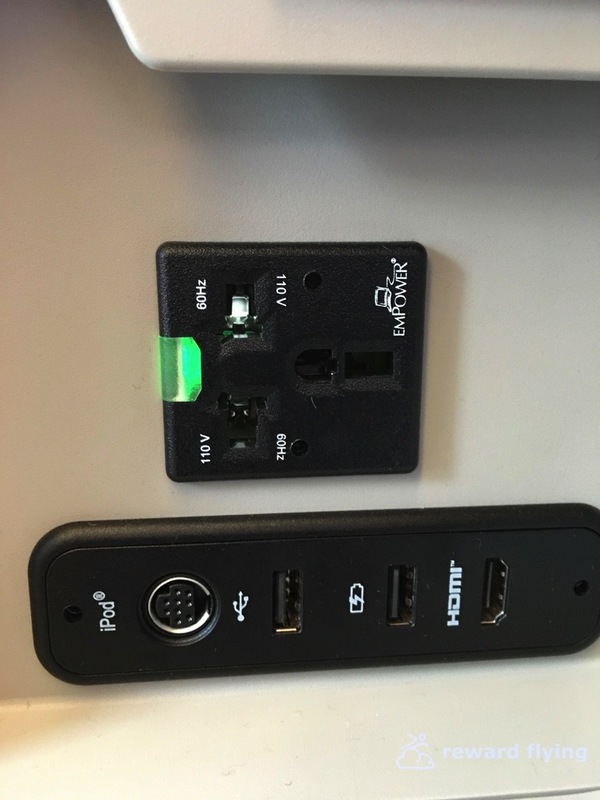 According to Singapore you can link your personal device to the IFE and control it. I wasn't able but in fairness I didn't have much time to work with it. The airshow was available and as I mentioned the screen was fabulous. Something unusual did happen on this flight. When the engines were started the cabin filled with a heavy vapor of jet kerosene. It's been a long time since I've experienced it that bad, and for a new aircraft I thought it odd. Hopefully it's not a trait of the A350 and was an isolated instance. 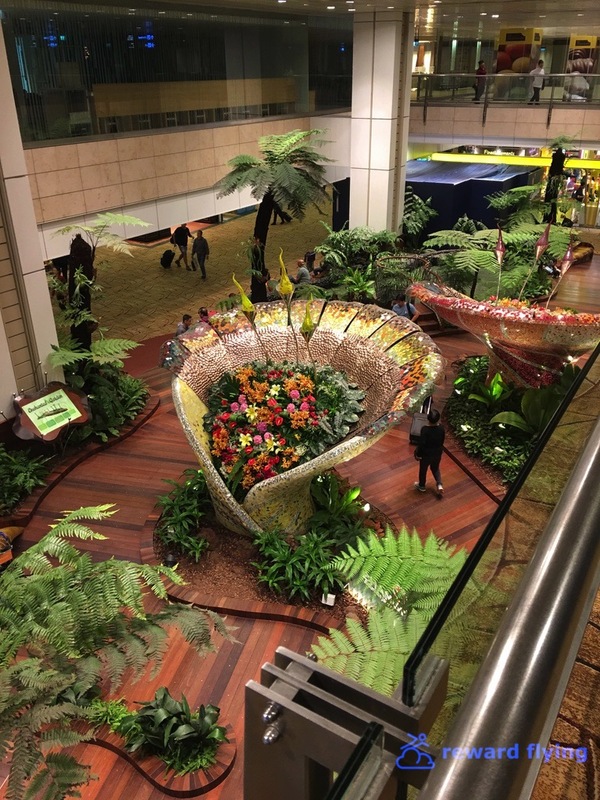 Changi airport is an amazing place. It's a huge food court and shopping mall. I'm pretty sure it's open to the public as security checks are done at the gate and there were all kinds of activities for kids going on with plenty of families participating. But I never made it to the swimming pool. The highly recommended lounge was fine but not as spectacular as I anticipated. 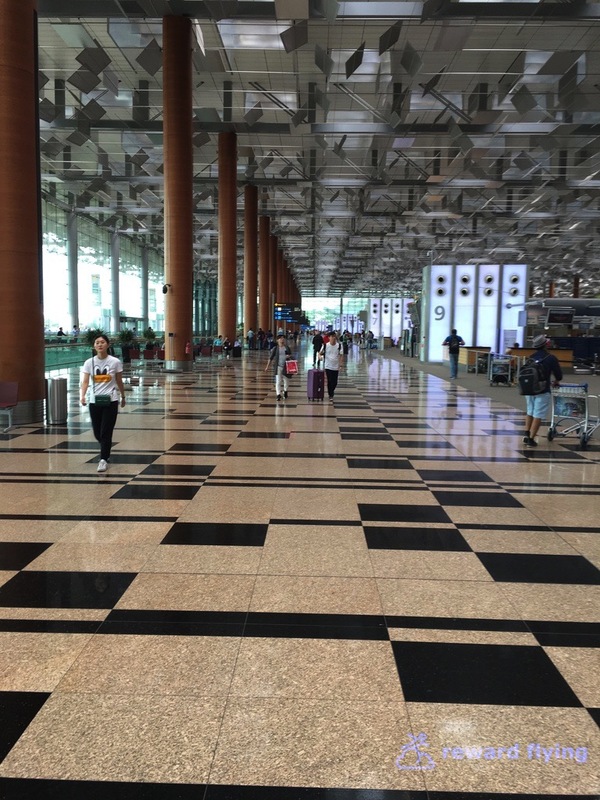 Someday I hope to be back at Changi, boarding the A350 for a slightly longer flight! 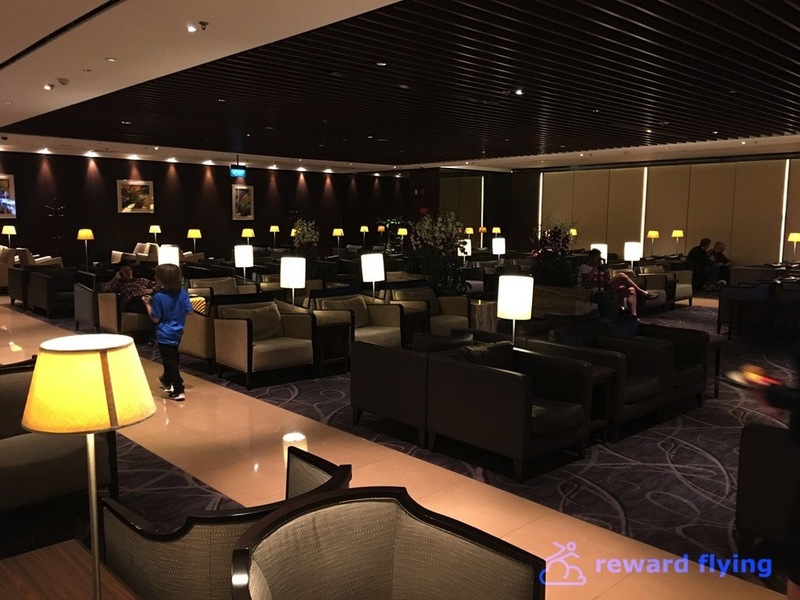 Singapore has fairly decent reward space for Krisflyer members (that’s their mileage program). 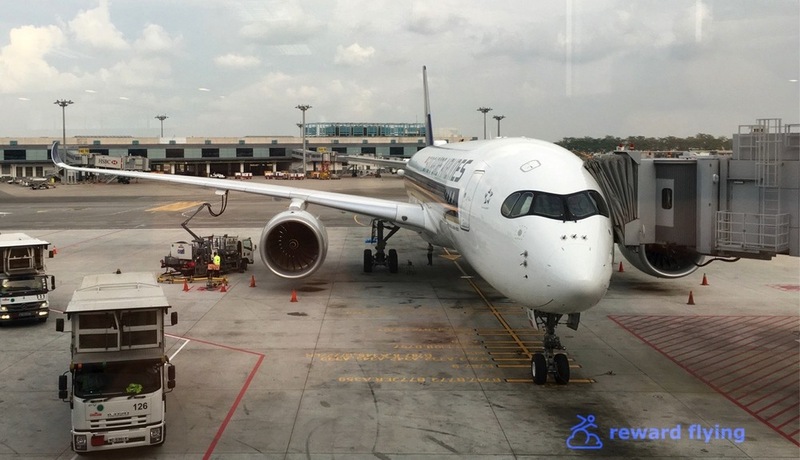 But they do not release much inventory to Star Alliance partners, and never release any long haul inventory, only regional flights in Southeast Asia. On top of that you won’t find anything doing a Star Alliance reward search because the inventory is not loaded into the reward database. So you have to call for availability or the easiest way is to have a reward search tool such as Award Nexus to find the inventory. For me this flight was part of a ticket from Singapore back to Chicago. However on it’s own, the saver fare is 30,000 miles for business class on this route. 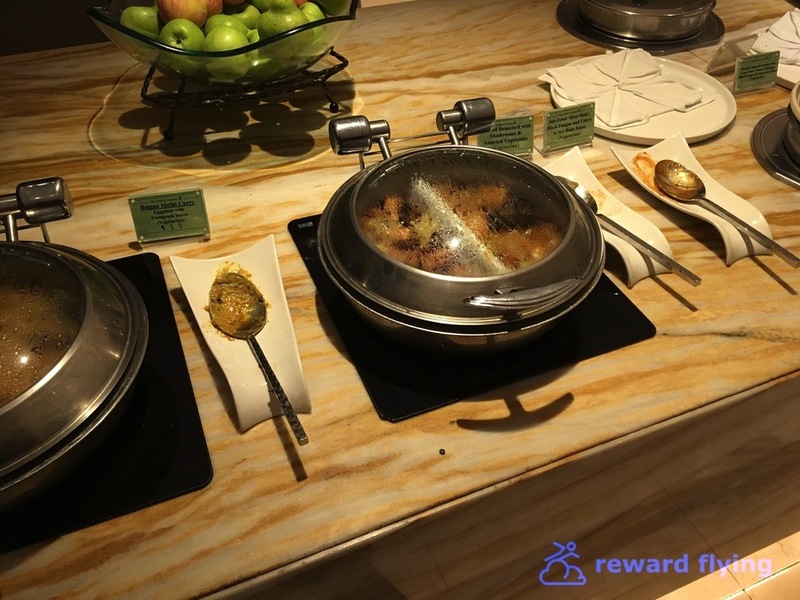 The retail price is $367.00 That equates to 1.2 cents point valuation, which is only slightly better than getting a typical Delta reward. As mentioned you have to call to get this ticketed. But since you can’t book online the agent fee is waived. 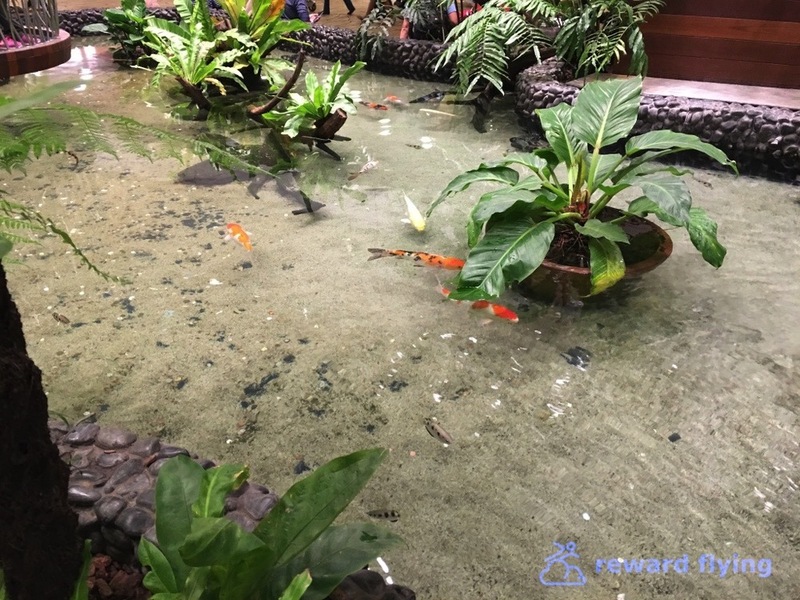 Sometimes the hype leads to disappointment and that was clearly the case with the Krisflyer Silver lounge in Terminal 2 Changi airport. Don’t get me wrong, it was a beautiful lounge. But nothing special in my opinion. The food was ok, not really plentiful or with much variety. Typical selections of drinks with one exception. No bottles of water. Unless I just couldn’t find them. But it was quiet and better than hanging out in a crowded airport, so no complaints. More pictures! Here are some of the controls; seat adjustment, power and lighting. 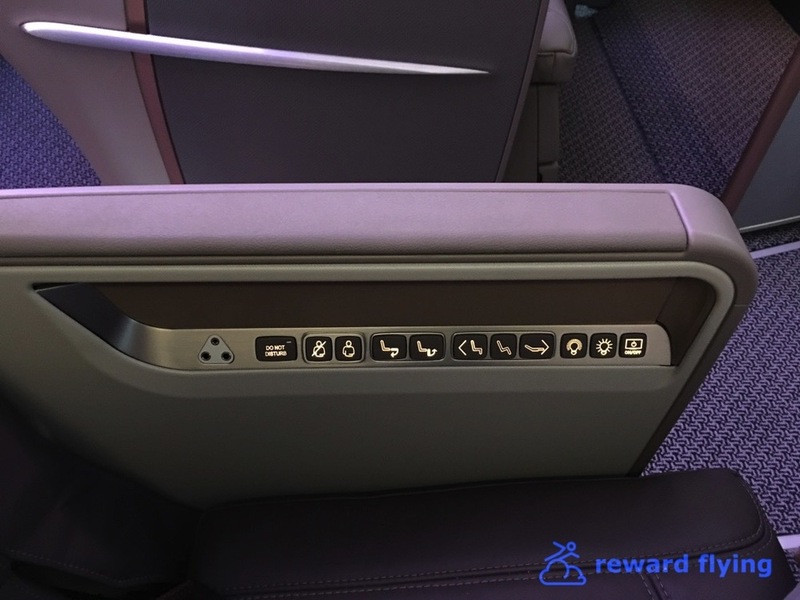 It’s hard to judge what a seat is going to be like over the long haul by only sitting in it for an hour, but I have some suspicions it might not be as comfortable as you’d expect. But I won’t make judgement, and just go with the beauty of the seat for now. The seat must be reclined manually, which of course was not done on a 30 minute flight. But you do sleep on an angle when it’s reclined. The whole manual part doesn’t make much sense to me. The IFE monitor was large and close in for great viewing. And the airshow was well done. I didn’t have a chance to review anything else about the system. This aircraft did have WiFi but I did not use it. When you enter the aircraft flight attendants are stationed in the aisles and the request to direct you to your seat. Very classy way to start. This flight was probably the 10th revenue flight the plane has flown. Brand new, less than 3 weeks old. What more can you ask for! 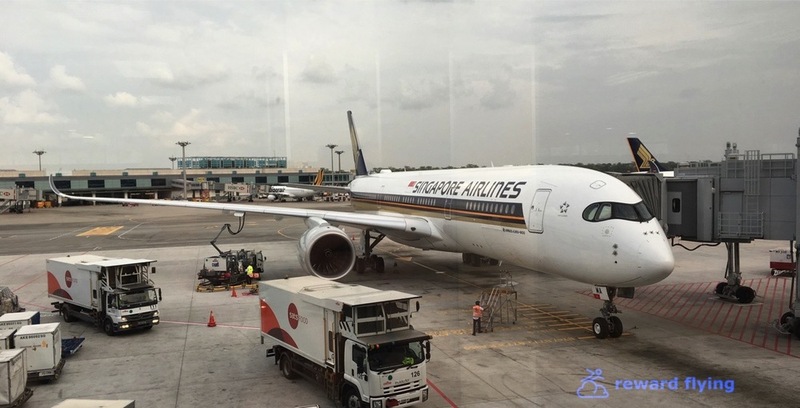 One final comment on Singapore Airlines. This was a 30 minute flight. They served a meal. 5 of 10 ✈ ! Take your first A350 flight! 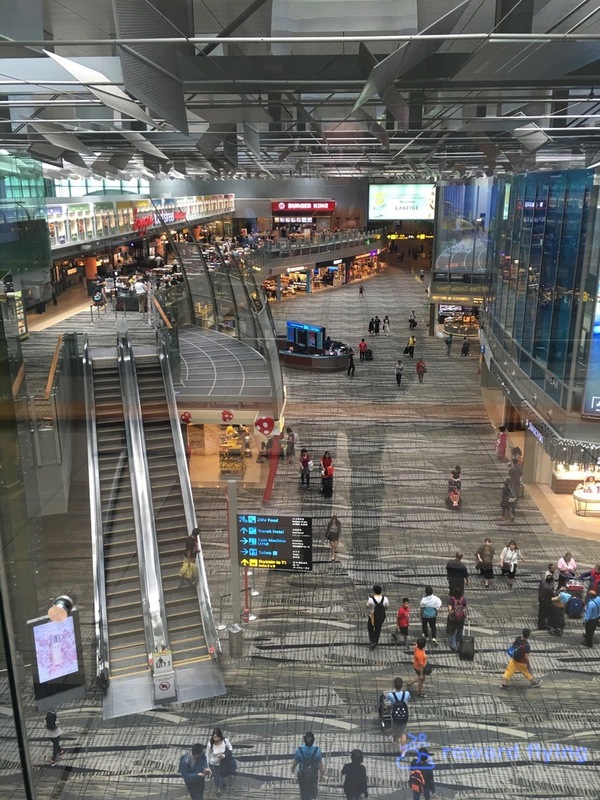 Do you have any Singapore Airline experiences you'd like to share? Feel free to leave a comment.